Riggio Custom Guitars Tango Model Solid Body Electric Guitar (2016), made in Tacoma, Washington, serial # 16026, Blonde lacquer finish, ash body, maple neck, original blond tolex hard shell case. Overall length is 38 3/4 in. (98.4 cm. ), 12 1/2 in. (31.8 cm.) wide at lower bout, and 1 5/8 in. (4.1 cm.) in depth, measured at side of rim. Scale length is 25 1/2 in. (648 mm.). Width of nut is 1 9/16 in. (40 mm.). This Riggio Custom Tango is this very detail-oriented modern builder's take on a Blackguard Tele. 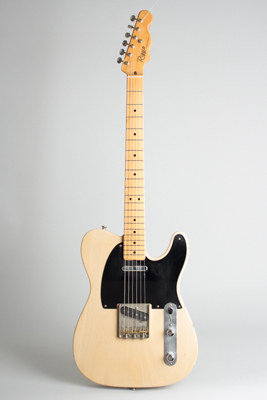 It features a medium/light ash body and chunky U-profile maple neck. Lightly relic'ed enough to feel played in, with the back of the neck worn in just right. This is an uncommon find on the used market and a really fine gigging Telecaster with a great feel. Includes the original case and unfilled warranty. Excellent + Condition.